About 9km. (5½ miles) taking 2½ hours. Can be shortened to 5km (3 miles). From the bridge over the River Dane, walk up the road towards Wincle. After 200m take the track left to Danebridge Fisheries, just before the first cottage. Walk past a pool on the right used by trout fishermen. On the left are trout rearing ponds. At Pringle Cottage keep on the fenced track to the left. Near the end of the track pass through a gate and about 20 metres later at the end of the surfaced track continue straight on into the meadow by the river and cross the meadow with the wood to your right. At the end pass through an open gateway by the river into the next field. Continue towards the far left corner of the field nearly to Gig Hall Bridge. Here you will see weirs in the river which were built to divert water into a feeder canal which channelled into Rudyard Lake. Do not cross the bridge but turn right up the field, keeping the wood on the left, for about 90m and cross a small bridge in the corner, to the left of the gate and stile.Climb a short slope up to a stile in the wall.Go over this and turn right up the hillside to a stile at the top of the field. Cross the stile on to a track and turn left.At the end of the track go over the stile to the right of the two gates. Cross the field to the left hand corner and go over the stile by the gate. Go straight across the next field, over the stile, and turn right on to a track. This leads after 100m to the site of a 15th century farmhouse, Dumkins, now demolished.The remaining building is from a later date. 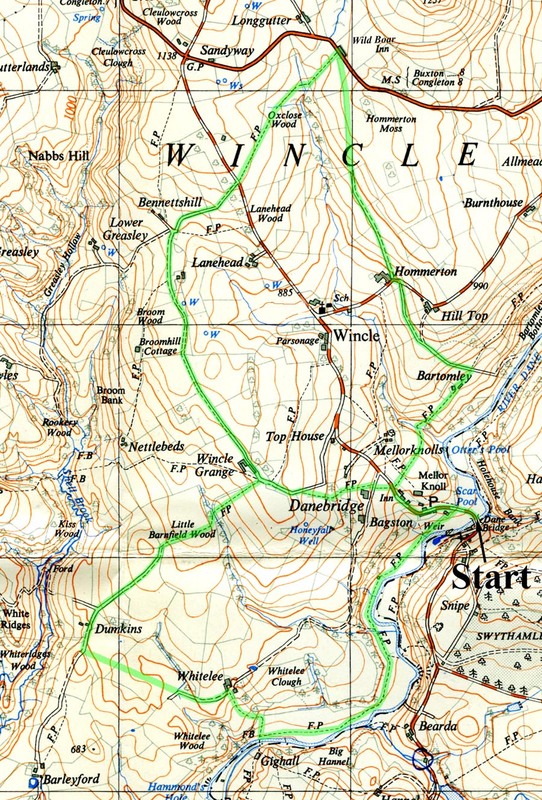 Continue past Dumkins along the sunken track to a stile at the end, go over and continue on the sunken track to a field at the top. Go straight ahead along the line of trees in the middle of the field to a pair of gates in the corner.Cross over the stile by the right-hand gate.Keep to the right alongside a now overgrown sunken track to the top of the hill. From this point there are fine views of the surrounding outcrops of rocks, Bosley Cloud to the rear and the Roaches and Hen Cloud to the right. Keep near to the wall on your right and drop down a sunken track and in a few metres bear round to the left along the track and cross the stream by stepping-stones to a stile in the left-hand corner.Cross the stile and walk up the left-hand side of the field, then go over a stile onto a minor road.The route for the longer walk goes left past Wincle Grange.The building is 14th century in origin and is thought to have been built by the monks of Combermere Abbey in mid-Cheshire.Probably the most interesting feature is the ecclesiastical-style windows which clearly show the religious connection of long ago.There is evidence of a secret passage from the building and also a walled-up room. The shorter walk can be taken by turning right along the minor road, passing a small pool on the right.After 150m look for a stone stile in the right-hand wall.Cross this and walk diagonally across the field to a second stone stile. Go over this into the wood and follow the trail steeply down, bearing left through the trees to a stile hidden behind a large beech.Cross this and continue down the right-hand side of the field to a further stile which leads on to a track.Immediately opposite is another stile, which cross and then walk diagonally left to a stile and stone steps down to the road.Turn right and walk past the Ship Inn and downhill back to Danebridge. The longer walk carries on past Wincle Grange along the minor road for 1.5km, leading to a junction with the road from Langley to Wincle.Note the Wincle 2000AD stone on the left of the junction.Cross the road and climb the steps over the stile into a field.Walk diagonally left across the field to a ladder-stile in the wall, next to a creep hole for sheep in the base of the wall.Cross the stile and keep on in the same direction in the next field.The Wild Boar Inn can be seen in the distance ahead.Make for this, crossing a stile over the wall in the hollow then, keeping the holly trees on your right, cross the stream and go uphill to the gate and stile opposite the Inn. Cross the stile but do not cross the road.Instead take the gate immediately to the right and head back South across the centre of a large field.As you reach the crest of the hill veer slightly to the right toward a line of trees and a wall which have just come into view.Keeping these to your right, descend to a walled track.This track eventually veers off to the right to Hammerton Farm, but ignore this turning and go straight on down the grassy track and through a gate on to the road.Turn left up the road and after 50m turn right down a track to Bartomley Farm. Ignore the gate at the bottom of the track and turn right through the farm gate, down the drive and into the farmyard.Immediately past the first buildings on the left there is a stile over the wall.Cross this and turn right across the field passing a small hillock on the left.This hillock is considered to be a Bronze Age burial site and consists of a natural outcrop of rock with additional material added to form the mound. Continue in the same direction to a stile which leads to a steep path down through the woods to a stream in the hollow.Cross the stream by the footbridge and follow the path upwards to the left to a stile in the wall.Cross the field straight ahead to the angle of a wall coming from the right.Continue past the footpath sign and head slightly left, with the walled garden on your left, to a gate in the corner.Leave the field via the gate and follow the narrow path down the steps on to the road.Turn left down the road past the Ship Inn and downhill back to Danebridge.